Great to have another player!! Welcome!! There's also a great pin of Stitch dressed as Carmen Miranda, but I thought I'd give Minnie a chance to shine! 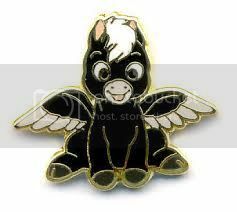 OK, that pin looks like Mickey has a Mohawk. So, here you go. 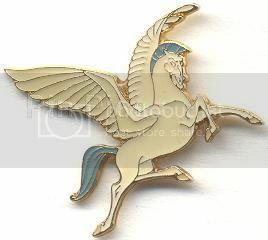 Becasue let's face it, Pegasus is one badass character. OK, adorable and all in black. Made me think of this (fantasy) pin of Scrump, Lilo's handmade doll, dressed as Maleficent. And everybody's favourite crab is Sebastian! Sebastian appears to be singing, so it made me think of this pin where he is serenading Eric and Ariel. You wanna kiss the girl! The spool of thread reminds me of this pin. Are we the only two playing? It looks like maybe we are the only ones playing. But that's OK, since we're having fun!! I love this 6-pin set of Stitch invading other movies. 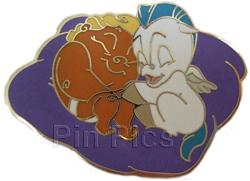 My favorite pin from the set, however, is this one. Well, my favorite part of the Hercules movie was the Muses. Haha, so it seems like all my connections are being made through songs! Well, some of the Elisabete Gomes pins are shaped like vases (presumably these pins are copies of actual vases she made?). So, here's one with Mickey and Minnie. Sticking with my use of Disney songs to make my connections.. I always think of Sabor with tarzan! !